The Pinnacle, or else called The Bishopsgate Tower, is a brand new development in central London and its construction continues until today, more specifically it's currently on hold. The architect of the project is Kohn Pedersen Fox and the developer is Real Estate AG, which is a fund management company. It is located at 22-24 Bishopsgate in London (closest tube station: Aldgate). Its construction started in 2008 but since March 2012 it has been on hold to the point where only the concrete core of the first seven floors is completed, there is still a long way to go if you ask me, considering there will be 64 floors for this building. 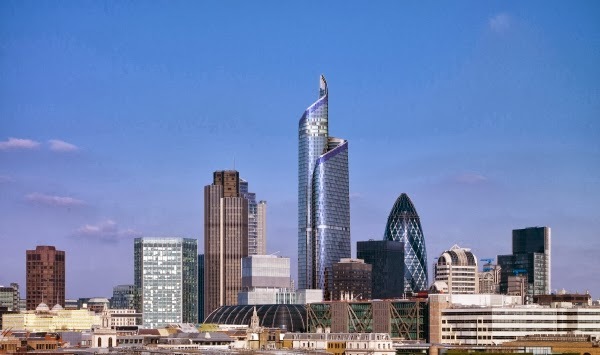 Even though it is unknown when the construction of the building is going to be complete, The Pinnacle will be the tallest building in the area of Central London and the second tallest building in the UK and the EU with a height of 288 metres (tallest building will still be the London Shard with height of 310 metres). As referred above, the Pinnacle is currently on hold. That is because of lack of additional funding and letting commitments. The current state of the building leaves its future in doubt and the project will be re-designed.